Downtown Partners is launching a visual campaign that will install graphics on available spaces in downtown Sioux City. The demonstration is being used as a tool to assist potential business owners in easily finding spaces available. These windows of opportunities are meant to inspire a vision for the space and help fill voids that exist within these walkable areas. 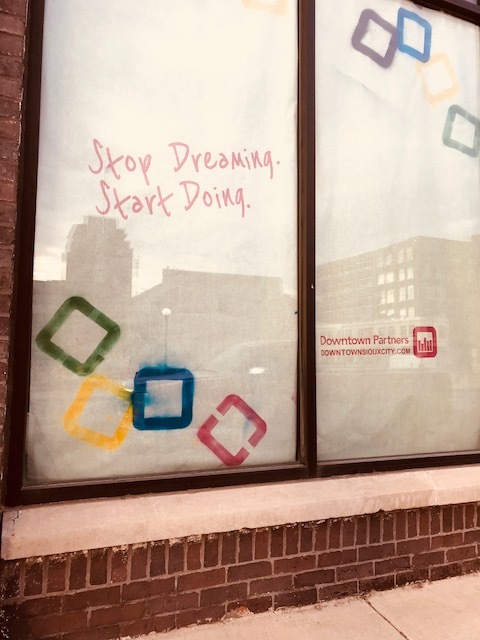 The image on the displays feature the Downtown Partners logo, identified through squares of different colors and sayings such as “Make a move!”, “Be Downtown!”, “Stop dreaming, start doing!” and several other motivating and fun statements. Eight locations were selected on buildings around downtown and all are located on the street level in areas that get steady daily foot traffic; 615 Pearl Street, 507 5th Street, 508 5th Street, 413 Pierce Street, 509 4th Street, 525 4th Street, 714 4th Street and 416 Jackson Street. Each of the window displays will direct people to contact the owner or broker of the property and will also list the downtown Sioux City website if they need further information. The displays were installed this week and will remain until the displays become unusable or until the space is rented. This visual campaign was created by the Downtown Partners Community work group. The group is comprised of downtown business owners, property owners, employees, residents and Sioux City community members. Their goal is to help unify and strengthen the influence of downtown’s various stakeholder groups and the community. They focus on initiatives to attract new amenities and services that enhance downtown’s appeal for living and help position downtown as the place for young professionals and rebounders to start business and innovate. Project costs were minimal due to the generosity and time of Knoepfler Chevrolet and the work group committee members. For more information, please contact Downtown Partners at (712) 252.0014 or downtownsiouxcity.com. Follow this project and everything else happening in Downtown Sioux City on Facebook @Downtown Partners – Sioux City and on Twitter #DowntownSCIowa.